The first part of this series looked into what has happened on the CM front over the last two years. But no trends report is ever fully complete without a prospective view. This new instalment further explores the findings of the latest PROSCI survey on state-of-the-art practices. From what respondents expect to happen in the next five years to whether and how to join the bandwagon, we trace the moving contours of the discipline in simple and practical terms. So, plan for the future accordingly! *PROSCI’s survey focused on what developments practitioners anticipate or expect to intensify in the next five years. Each trend is summarised with cross references to articles previously published by NEXUM for further reading guidance. 1. Continued alignment with other “improvement” methodologies. These last years have witnessed a more wide-ranging application of CM, with a particular emphasis on AGILE projects. Alignment with other methodologies such as Lean or Six Sigma is expected to keep growing. Building bridges with whoever is in charge of implementing these methodologies in the organisation is the easiest way to get to the front of this trend. It is also crucial to maintain a focus on CM as the most valuable approach to capturing the percentage of project ROI that depends on adoption and usage of the solution. CM is part and parcel of the improvement effort and history and should be referred to as such. 2. Establishing CMO’s: Change Management Offices. The existence of a CMO within an organisation is strongly correlated with its maturity level. Most CMOs are nowadays found in the retail trade or banking sectors, whilst non-profit and education form the rear-guard. Just as Project Management Offices (PMOs) have mushroomed, so too should CMOs (Change Management Offices). Mirroring the emergence of next-level EPMOs (Enterprise Project Management Office), it is likely that the CM centralisation process will continue and give birth to organisation-wide departments. For this to occur and to produce the best results, role definition is key. In a nutshell, CM offices are intended to drive changes, allocate resources, develop CM internal skills and coordinate efforts with other “improvement” methodologies discussed above. 3. Growing Awareness for the need of CM. Together with a better understanding of what CM brings in terms of ROI, awareness for the need of a structured approach to change should continue to increase. Insisting on the intrinsic value of CM and what dedicated resources can do for projects, people, teams and organisations will help maintain momentum and create better buy-in (sponsorship). With less justifying also comes more leeway for actual practice. 5. Better integration with CM. Respondents expect more and more project leaders to develop CM skills. An overall reflection on how to improve PM/CM integration has already been undertaken with the PMBOK (Project Management Book of Knowledge). As CM steps into Project Management Offices – and hopefully gets fully integrated –, there is an urgent need to set measurable objectives, develop a chart of roles and to specify relationships. Treating that move as a change in itself, using CM as a compass, is the best way to squeeze the most out of it. 6. Focus on managing change saturation. Changes are expected to multiply and the likelihood of them overlapping is becoming more obvious. It is only logical, then, that CM moves towards portfolio management. At stake is the ability to achieve greater value while taking in more changes. This is quite an issue given the current push to cut down on expenses. Against this background, the impact of CM efforts might be diluted and sponsors fully saturated. As the issue of change saturation moves up the CM agenda, now is the time to reach out to people managing project portfolios and learn how to combine or compile elements and optimise resources. Having hard numbers that prove CM effectiveness will probably become a prerequisite. Adoption, usage and proficiency are certainly key variables but they should still be considered in the light of metrics such as project or change initiative ROI. 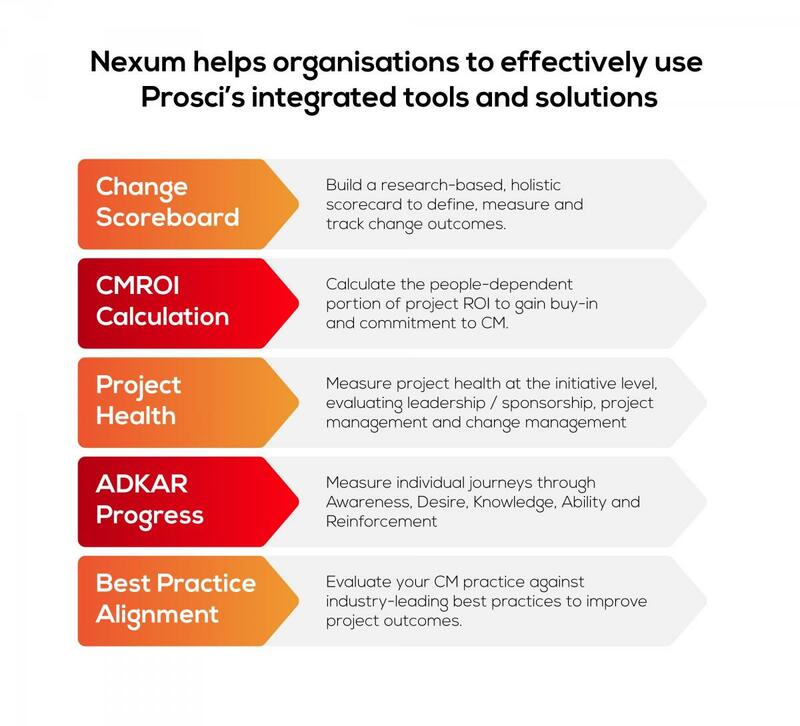 Together with PROSCI, NEXUM has developed an assessment sheet to assist with presenting structured and concrete outcomes to stakeholders. For any change initiative, it allows for a proper measuring of organisational performance (or overall business progress), individual performance along the ADKAR continuum and CM performance (or overall progress on the people side of the project). 8. More technology to assist change. Designed to back up assessment, creation and implementation of CM plans, technological tools are attracting increased attention. Cloud applications, social media, digital assessments and predictive analytical tools will become the leading edge of CM. Predictive tools are of particular interest as a means to extract knowledge from existing data, analyse them against a specific project/ sponsor or conversely, understand success across multiple initiatives.